PATUXENT RIVER, Md. 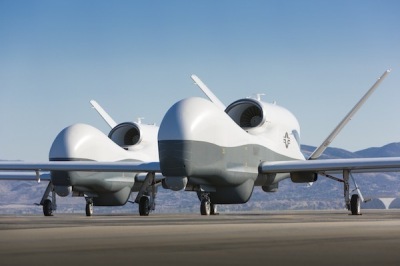 --- The Australian Ministers for Defence and Defence Materiel announced May 15 that the government of Australia will enter into a Foreign Military Sales (FMS) planning case with the U.S. Navy for the MQ-4C Triton Unmanned Aircraft System (UAS). The FMS planning case will help Australian defense officials assess the applicability of Triton’s capabilities to their high-altitude, long-endurance UAS for maritime patrol and other surveillance requirements. According to a press release issued by Australia's Minister for Defence Stephen Smith and Minister for Defence Materiel Dr. Mike Kelly on May 15, "The goal is to provide long-range, long-endurance maritime surveillance and response and an effective anti-submarine and anti-surface warfare capability." Australia's interest in the U.S. Navy’s persistent maritime surveillance unmanned systems development dates back to 2007 when it participated in the Broad Area Maritime Surveillance (BAMS) UAS pre-system development and demonstration under a cooperative partner project agreement. "Our team is eager to partner with Australia on this FMS planning case involving the MQ-4C Triton UAS," said Capt. Jim Hoke, the Navy's Persistent Maritime (PMA-262) UAS program office here. "The development of a system based on the Triton UAS would significantly improve Australian and US capabilities in the region, enhancing our joint ability to respond to regional challenges, including humanitarian assistance and disaster relief." As an adjunct to the manned P-8A, the U.S. Navy's Triton will be able to cover more than 2.7 million square miles in a single mission. Its capability to perform persistent intelligence, surveillance and reconnaissance with a range of 2,000 nautical miles will allow P-8A, P-3C and EP-3E aircraft to focus on their core missions, adding to the capability of the Navy's Maritime Patrol and Reconnaissance Force. Australia is a cooperative partner with the U.S. Navy in the development and production of the P-8A.